Blessed Anna Rosa Gattorno was born in Genoa, Italy on October 14, 1841. Her family was a well-to-do family of good name, and had a deeply Christian practice. At baptism she was given the name of Rosa Maria Benedetta. She was one of six children, and found in her parents her first models of moral and Christian life. The custom of her time was to be educated at home, especially when from a wealthy family. She had a very peaceful and lovable character, and practiced piety and charity. She however was outspoken and did not back down from confrontations of the political climate of her time, which were not always in line with Christian morals. She married at the age of 21, and moved to Marseilles. They soon fell upon financial difficulties, and had to return to Genoa in a state of poverty. The hard times didn’t stop there, her first born child Carlotta, had a sudden illness that left her deaf and unable to speak for life. Her husband attempted to find fortune abroad, and received a fatal illness, leaving her a widow with three children, less than six years into marriage. A few months later, she lost her youngest son. With so many sad events in her life, she had a conversion to the total gift of herself to the Lord, to his love and to love of neighbor. Purified by her trials and strengthened in spirit, she understood the true meaning of pain, and was confirmed in the certainty of her new vocation. Under the guidance of her confessor, Fr. 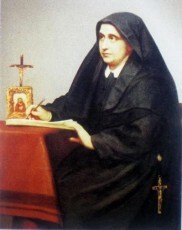 Guiseppe Firpo, she made private perpetual vows of chastity and obedience on the Feast of the Immaculate Conception in 1858, vows of poverty in 1861, all in the spirit of St. Francis of Assisi, as a Franciscan tertiary. She received daily, Holy Communion, which was very uncommon in those days. She grew daily in her intimacy with the Lord, and it is in Him, that she found her support, missionary fervor, strength and zeal for service to her brothers and sisters. In 1862, she received the gift of hidden stigmata, and was most intense on Fridays. She never deprived her children of anything, always loving them tenderly. Her goal was to serve those in need with what she could, serving them in all things. All Catholic associations in Genoa competed for her, and all noticed her way of life. She was made President of the “Pious Union of the New Ursuline Daughters of Holy Mary Immaculate”. With this new role, she doubled her prayers to Christ Crucified. She finally left the association in Genoa, and founded her new religious order in Piacenza, and named it “Daughters of St. Anne, Mother of Mary Immaculate”. She took her vows on April 8, 1870, with twelve other Sisters. She entrusted herself totally to Divine Providence, and was dedicated to attentively caring for any form of suffering of moral and material poverty. This was all for one intention, of serving Jesus in his painful and injured members, and of “Evangelizing” first and foremost, with her own life. Her institution spread quickly, in Italy and abroad. She was devoted to be “Jesus Voice” and to bring all people the message of the love that saves. In 1878, she was sending her first Daughters of St. Anne to Bolivia, Brazil, Chile, Peru, Eritrea, France and Spain. In Rome, where her work began in 1873, she organized boys and girls schools for the poor; nursery schools, assistance for the new born babies of workers in the tobacco factories, houses for former prostitutes, nursing the sick, and caring for others in their homes. By the time of her death, there were 368 houses in which more than 3,500 Sisters were carrying out their mission. The secret to her journey to holiness, what one of charity and of strength of mind, with which she faced all obstacles with firm faith and for the Crucified Christ. For thirty-four years she had continuous union with God, and total abandonment in Him. She had unceasing prayers for the conversion of sinners and the sanctification of all mankind. She had a deep and profound sense of belonging to Church and was ever humble, devout and obedient to the directives of the Pope and the Hierarchy. She had a deep fondness of St. Anne, and a special love for Mary, to whom she entirely entrusted herself. She lived this exemplary life until February 1900, when she came down with a dangerous form of influenza. Her health rapidly deteriorated, and her workload became too much. On May 4, 1900 she received the Sacrament of Anointing of the sick, and two days later on May 6, she died at 9am. She died a Holy Death, in her Generalate. The fame of her holiness, which had surrounded her during her life, spread after her death and grew all over the world. Her life was one of rarity, she had a three-fold experience as Wife, Mother and Widow, and then Religious and Foundress. In her mission of service to humanity and to extending the Kingdom, she brought honor to God through all of these. Her charism has spread in the church with the birth of other forms of Evangelical life – Sisters of Contemplative life, a Religious Association of Priests, the Secular Institute and the Ecclesial Movement for the Laity, which are all active in the Church, in almost all parts of the world today. Blessed Anna Rosa Gattorno was born in Genoa, Italy on October 14, 1841. Her family was a well-to-do family of good name, and had a deeply Christian practice. At baptism she was given the name of Rosa Maria Benedetta. She married at the age of 21, and they moved away. Hard times fell on her, they lost their fortune, and her first baby was born with an infection that left her deaf and unable to speak for life. Her husband became fatally ill and died, and six months later, she lost her youngest son. All of this happened within 6 years of her marriage. She dedicated herself to God, and entrusted her entirely to Him. She carried the hidden stigmata, and dedicated herself to the Crucified Christ. She went on to found the “Daughters of St. Anne, Mother of Mary Immaculate”. To this day, there are over 3,500 Sisters carrying out all sorts of work for those in need. She found the Crucified Christ in everyone she served, always preaching the Gospels, through the actions of her life. Her charism has spread in the church with the birth of other forms of Evangelical life – Sisters of Contemplative life, a Religious Association of Priests, the Secular Institute and the Ecclesial Movement for the Laity, which are all active in the Church, in almost all parts of the world today. She is a role model to many, as she served God in many vocations in life – Wife, Mother, Widow, Religious, and Foundress.